Just 15 hours until I know if I’m in for NYC 2010. That’s all I want to do this year. Hopefully tomorrow at 12:15 pm my new office mates will wonder why I’m screaming in excitement. I’m nervous thinking about the training if I do get in, but the idea of running such an amazing race will get me through it. I know for sure that if/when I get to run NYC it is going to be one of the most amazing experiences of my life. Today I was talking Kristin, a running/ TNT friend, about it. She ran it last year and said it was one of the most up there, amazing life experiences. Right up there with giving birth even according to Kristin. Tomorrow we will see what happens. In the mean time, I have developed an absolute obsession with Whole Foods. Last month they opened one 5 minutes away from work. I have always loved Whole Foods. Several years ago I was on a gluten free diet and I used to drive over an hour so I could buy GF goodies! Crazy right?! So finally, one opened here. Did I mention now I get an hour for lunch now 😉 This might be dangerous. There is even free Wi-fi too in the store, which is great for the Whole Foods recipe app that I downloaded. I think this is really going to help me with meal planning and shopping for the week. I just select the recipes I want and add them to my list. It totals all the ingredients from all the recipes into one shopping list that I can check off as i find each item. Perfect, I love it! I can’t wait to try it out on my next shopping trip. Which came in handy today while grocery shopping. 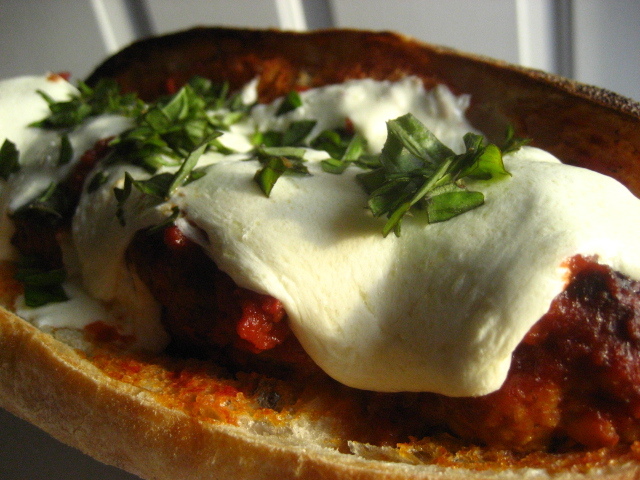 I spontaneously decided to make these amazing ricotta meatballs from Elise at Simply Recipes. I’ve made them a million times, but can never remember everything I need. Logged on and shopped off my I-touch! How cool! After my shopping adventure I came home and made my own ricotta. 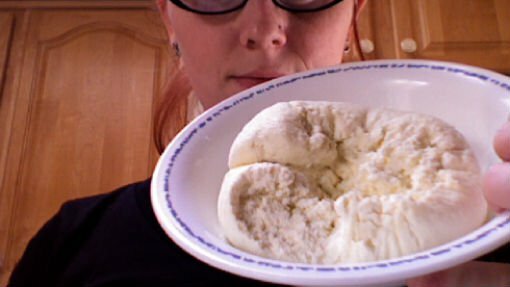 It seems like something so difficult, but if you can boil water you can make ricotta. I promise. It’s so worth it. One pet peeve about commercial ricotta is how wet it is. Soggy lasagna is what I end up with. This is drier and it crumbles right into whatever you are making, or your mouth if your Kuma or I. Here’s the secret from David Lebovitz, on Simply Recipes. Lastly, I realized how many races I have coming up in the next 2 months!! 3 5Ks and 2 half marathons! I’m thinking about getting myself a running skirt to wear for them. The adorable twins at Running Skirts.com has so many cute ones, with compression shorts underneath (to avoid thunder thigh chafe). Plus they have pockets on each side. I love running clothes with pockets, between carrying my inhaler and shotbloks I need them!! Wait packs just are not an option for me!! See you tomorrow when I know about NYC!!! ← Hoppy Easter! And a Bondi Band Winner! Hey!! If I hear screaming down on my deck – I will know!! Good Luck!! By the way – you “can” also drain regular store purchased ricotta in cheesecloth and it will be drier… it is how you make cannoli cream for cannoli… YUM! I may try to make the homemade ricotta.. since I think the store bought is actually too salty.. It seems easy..
GL! It sounds like you have two big things you want to complete this year – best of luck with both. Hope you get in! And I just got the floral skirt, too cute. But I love the pink dots too! For sure the floral print!!! Too cute – once my legs are little tighter I will definitely be getting some of those! I love the floral skirt. Hope you get good news today.